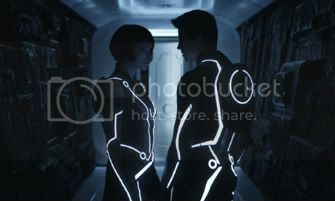 “Tron: Legacy” is a highly-anticipated sequel to 1982’s “Tron,” which has become a cult and sci-fi classic as one of the first films to integrate C.G.I. special effects with a live-action film. “Tron: Legacy” picks up 20-plus years after the original and we meet Sam Flynn (Garrett Hedlund) who has secretly been hoping to find his father Kevin Flynn (Jeff Bridges) who, unknown to the rest of the world, has been trapped inside the virtual world he created. I was lucky enough to be at an IMAX 3D screening where the screenplay writers Adam Horowitz and Edward Kitsis were there to introduce the preview footage and talk a little about their journey of writing and making the film. They said this movie got made because of ultimate fans like us. They said that when they brought some test footage to the San Diego Comic-Con three years ago, the reaction was so positive that it was those reactions and comments that help persuade Disney to green-light the making of the movie. Then they talked a little bit more about their involvement and gave out some cool prizes and then the preview began. Not wanting to give too much away for those who were unable to attend a preview screening, I’ll just sum up what each scene was about. Starting off in the real world, Sam Flynn pulls his Ducati into a waterfront garage where Alan (Bruce Boxleitner) is waiting for him in the shadows. They reveal Sam’s rebellious side in talking about daredevil stunts and how Sam is not ready to run his father’s company. Alan tells Sam that he received a page from his father’s old office at the arcade that’s been closed for 20 years. Alan gives Sam the keys to the arcade and Sam heads down there out of curiosity. He enters and flips the breakers and the arcade springs to life with all of the sounds that are familiar to anyone who has spent time in an old-school gaming establishment. As he begins to leave, a game in the corner catches his eye: TRON. He finds a secret passageway behind the game and descends a staircase to a workshop deep under the bellows of the arcade. Sam starts to play around with the main computer and a laser behind him springs to life and the screen whites out. The newly suited-up Sam is locked in a square chamber and then we see a bunch of similar chambers rising up to the top of the arena. The chambers combine in groups of two and we see a dark, cloaked figure watching the games from high above. Very quickly, the Disc Wars begin and a confused Sam doesn’t know what to do. He finally sees how the disc on his back works as a weapon and after a quick-paced skirmish with another program, he emerges victorious and demands to be released. This scene begins seemingly in the midst of a lightcyle battle. Two lightcyles are pursing Sam who is in a four-wheeled lightrunner that contains Sam in the passenger seat and a masked driver. A very quick and exciting chase ensues and the driver of the lightrunner manages to destroy a lightcyle. As the driver is flung into the air, he materializes a new lightcyle beneath him and the chase persists. Blowing a hole in the side of the arena and taking off into the dark mountainside out of the city, the driver is revealed to be Quorra (Olivia Wilde) who says that the lightcycles can’t pursue them out of the arena as they won’t work out of the grid. They race off into the dark far away from the arena and the lit city until they come to a dead end and as soon as it seems like they will crash into a hillside, it opens up revealing a tunnel running through the mountain. Sam and Quorra enter a very white and Zen-like room in which a man sits in the center, meditating and surrounded by white light. Quorra goes over and speaks briefly with the man, who turns out to be Kevin Flynn (Jeff Bridges), Sam’s long-lost father. After a quick embrace and a touching scene between father and son, you see how emotional Sam is … while his father is not. Kevin tells Sam that they can speak and catch up after lunch and he leaves the room to go on the balcony. Quorra and Sam discuss a lightcycle in the middle of the room that she says is one of the original lightcycles ,but still far faster than the ones used today. Lastly, we get a montage of action sequences that stars off with Castor (Michael Sheen) telling the DJs to pump up the music (the DJs are none other than Daft Punk, who supply the music for the movie). We see lots of action, more lightcycle sequences, more of the de-aged version of Kevin Flynn and just a flurry of exciting images. Overall, my impression of the entire preview was just WOW! I was hoping for a bit more action sequences, but just like the “Avatar” preview last year, they want to draw you in and give you just enough to leave you salivating for more of this completely immersive world. The sound design and music is the best use I’ve seen so far for the IMAX speakers. Just like the action in “The Dark Knight,” my chest was shaking from the expansive and deep sound of the base and I was truly impressed. Being a fan of the first movie helps, but you truly don’t have to be a gamer geek or an avid fan like most to enjoy this movie. I bought my tickets for the midnight showing, opening day, when they went on sale a few weeks ago. If you plan on seeing this movie, seeing the original will help you understand the world and a few re-occurring characters. And please see “Tron: Legacy” in IMAX as it is supposed to be seen, but don’t forget to buy your tickets ASAP, as opening night and weekend tickets will be sold out very soon.